Over the past 1-2 years, two major trends that supported global investment have gone into reverse. These trends are China’s rapid industrialisation and the commodity price cycle. Both, China’s economy and the extraction industry (which accounts for the biggest share of investment for commodity exporters) are capital intensive and therefore likely to have a disproportionate impact on investment. Reduced investment demand and weaker productivity have already lowered global neutral interest rates – the rate consistent with trend real GDP growth and a stable inflation. Being near the zero bound, lower neutral rates reduces the potency of monetary policy conveyed by the current low policy rates, which by definition is the difference between the neutral rate and the central bank’s policy rate. To keep the narrative concise, below I will focus on the most general measure of capital investment – gross fixed capital formation. Since the post-crisis recovery in 2010, global real investment growth has been on a downward trend. In 2015, investment growth slowed further to 2.2%, which is the lowest rate since 2002 (excluding the global financial crisis). But despite a slowing growth rate, the level of global investment is generally robust, and broadly in line with its long-term linear trend. Furthermore, using simple nominal US dollar terms, globally we are currently investing the biggest share of total economic output since the collapse of the Soviet Union in 1990! Thus, on the surface, except for the slowdown in the growth rate in recent years, there seems to be no apparent weakness in global investment. But, as is often the case, global aggregates hide diverging trends. Most recent studies tend to focus on advanced economies (AEs), almost uniformly reaching the conclusion that AEs’ investment since the crisis has indeed underperformed expectations and that one of the key reasons for that is the weakness in demand (see for example IMF, BIS, OECD, Bank of Canada). 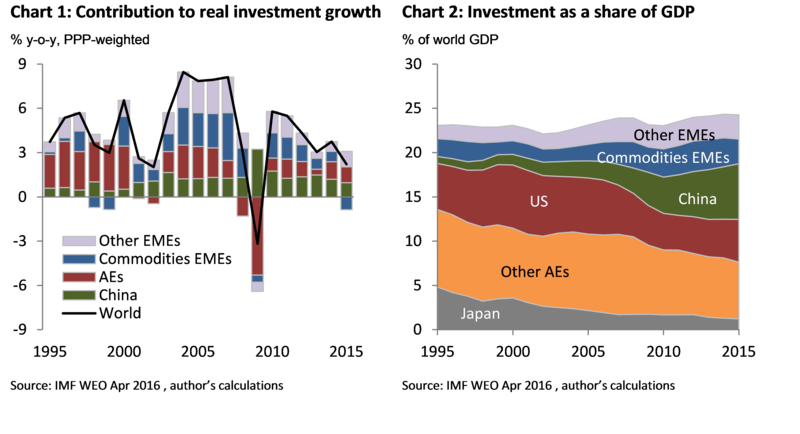 What explains the apparent resilience of global investment is the growing weight of EMEs. Their relatively higher growth rates propped up global investment as a share of GDP (Chart 3). Meanwhile, EMEs are also responsible for the persistent growth slowdown in recent years. Investment growth in EMEs has been slowing consistently for the past 5 years, in 2015 falling yet further to just 2%, which was below the AEs’ growth rate (2.5%) for the first time since 1999. Investment in AEs fell sharply during the GFC and while the growth rate has somewhat recovered, it was not enough to return investment to its pre-crisis level (Chart 4). 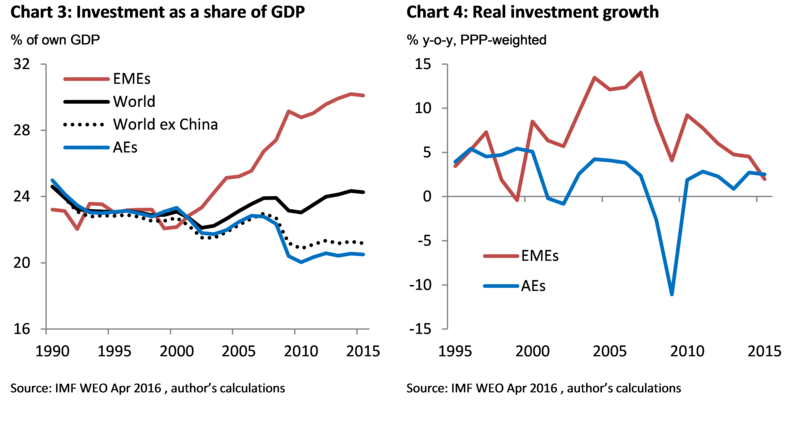 At least for investment, decoupling in growth rates between EMEs and AEs has vanished for now! China’s insatiable appetite for capital investment meant that its growth rate has been generally above that of the world or other major EMEs. As a result, its weight in global investment has increased dramatically, from under 10% in 1995 to around 30% in 2015 (Chart 2). This increased weight alone can explain almost the entire strength of global investment in relation to economic activity. The world excluding China is investing significantly less today, relative to the size of the economy, than before the global financial crisis (Chart 3). Nevertheless, growth of capital investment in China has been on a downward trend, slowing further in 2015 to its lowest rate since 1999 – a sign of progressing structural-economic rebalancing towards consumption. As a result, Chinese investment growth has declined from just under 9% in 2012 to 5.5 % in 2015. But China is not responsible for the slowdown in global investment growth since the crisis – the country’s slowing growth has been largely offset by its rising weight, leaving China’s contribution to global investment growth broadly constant (Chart 1). A large part of the recent slowdown in global investment growth and the acute weakness in 2015 can be explained by the commodity-exporting EMEs. The prolonged period of high commodity prices (Chart 5) prompted a significant increase in investment in these countries. But since the initial post-crisis recovery their investment growth has been on a downward trend. In 2015 investment in oil and gas projects worldwide contracted by some $160bn (-25% on the 2014 level), which is the largest proportionate fall since the late 1970s according to BP Statistical Review. And capital spending has continued to fall sharply this year. On the back of reduced capital spending, total investment growth in commodity-exporting EMEs contracted by 4.5% in 2015. It also appears to be public spending that contracted the most, perhaps reflecting the overreliance of public finances on commodity export revenues in many of those countries. China’s structural transition is still in its early stages and we are likely to see further investment weakness in the future. Furthermore, in many countries that experienced rapid investment growth in the past, a transition to more sustainable rates was rarely smooth, often accompanied by a sharp fall in investment as a share of GDP and a decline in per capita income (Chart 6). 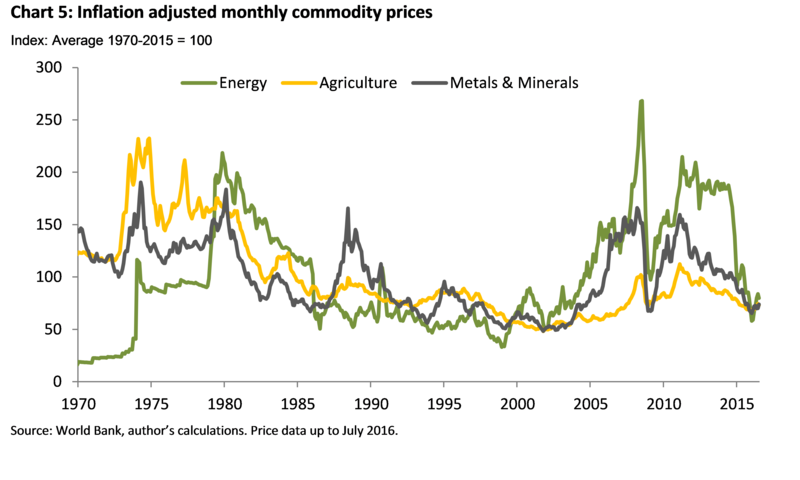 Investment growth in commodity exporters should eventually recover from current negative values, however, it will remain volatile and it may take a while before the commodity price cycle turns enough to encourage significant increases in spending. 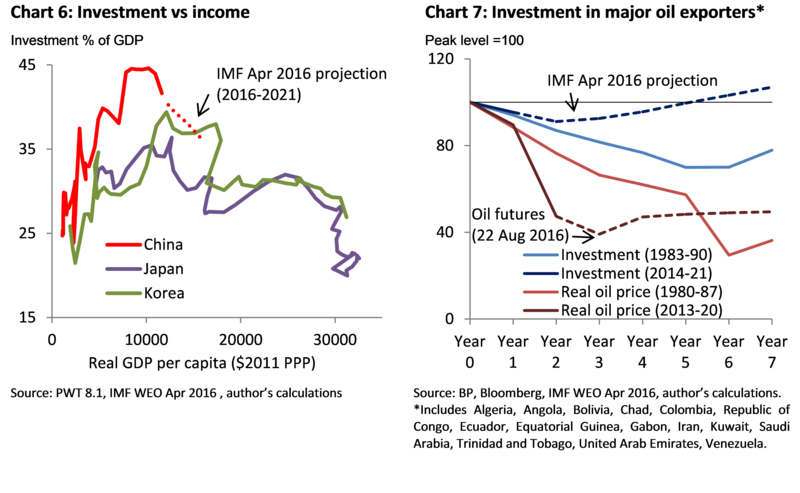 Moreover, past experience shows that the slump in investment following a price fall of similar magnitude could take quite some time to reverse – significantly longer than currently expected by the IMF, for example (Chart 7). One possibility is that investment is determined at the global level, with capital flowing to areas where returns are highest, and so decline in China and commodity-exporting countries will be offset by a rising share elsewhere, for example in advanced economies. However, this is less likely to happen in the presence of weak demand, which has weighed on AEs’ investment growth as described above. Therefore risks to future investment growth – from a further slowdown and rebalancing in China and a sustained slump in commodity-exporting emerging markets – are significant. Lower investment could significantly limit future productivity growth. Also, the strength in EME investment before the financial crisis ought to have provided support to global interest rates. If that support is now fading away, other things being equal, it could also contribute to further weakness in global real interest rates. With structurally lower global interest rates, the zero lower bound in AEs will become increasingly binding and the magnitude of stimulus conveyed by the current record low policy interest rates, expressed as the difference between neutral and policy rates, increasingly smaller.